It's our immense honor to welcome Dr. Rita Maran (left) as an IntLawGrrls contributor. As we have posted, Rita has described herself as a "lecturer, author, activist in International Human Rights." She's taught at the University of California, Berkeley. As indicated by this poem that Naomi Roht-Arriaza wrote for Rita's 80th birthday party and published on IntLawGrrls, she is a friend to many of us. 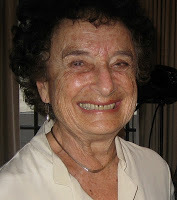 Rita's writings include a June 2008 manual, Human Rights for the University Classroom, a Active in the United Nations Association-USA, and a 1989 book, Torture: The Role of Ideology in the French-Algerian War. Her activism includes service as a founding member of the Board of Directors of Human Rights Advocates, a Berkeley-based nongovernmental organization, as Advocacy Vice President of the East Bay Chapter of the United Nations Association of the United States, and as an appointed member of the Berkeley Peace & Justice Commission. In her introductory post below, she discusses the background – including a Peace & Justice Commission resolution – that led to the 2012 Berkeley ordinance incorporating CEDAW, the U.N. Convention on the Elimination of All Forms of Discrimination against Women.